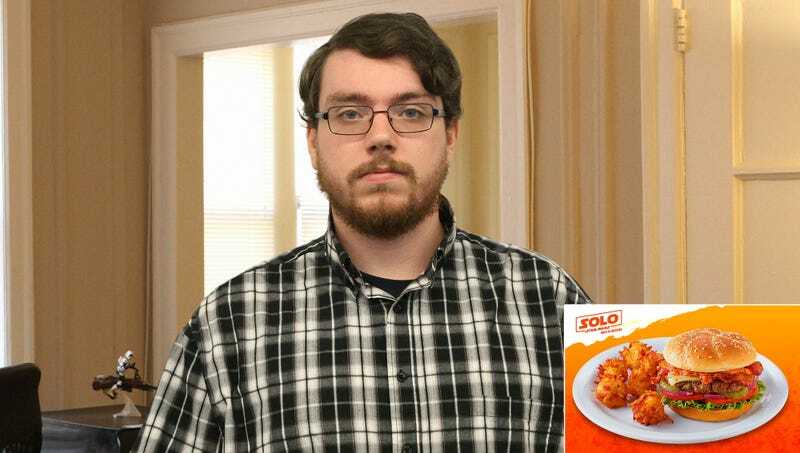 GREEN BAY, WI—Expressing concern that the latest film might let fans like him down, area man Tom Molina was doubtful Thursday that Solo: A Star Wars Story could ever live up to Denny’s Blaster Fire Burger. “I really hope the movie can match the immersive, world-building experience I had eating the Blaster Fire Burger, but I’m not holding my breath,” said Molina, 32, adding that he was confident the beef patty topped with spicy ghost pepper sauce was just as fiery hot as a laser bolt from Han Solo’s modified DL-44 heavy blaster pistol. “Denny’s did a great job of keeping the cheeseburger faithful to the Star Wars universe—there’s just no way in hell this movie will meet my expectations. Honestly, if Solo is even half as good as the Blaster Fire Burger, I’ll be impressed. I just hope it doesn’t give me diarrhea like the films do.” At press time, Molina had returned to his local Denny’s bedecked in a Lando Calrissian costume to enjoy the burger for a second time.